When the Twolegs (humans) destroy the warrior Clans' forest home, Graystripe — second in command of ThunderClan — is captured trying to help his comrades escape! Trapped in the pampered life of a kittypet, Graystripe has all the food and shelter he needs from his affectionate Twoleg family, but this is not the way he wants to live. The forest is calling him, and he never stops longing to go home. When he makes friends with a feisty kittypet named Millie, she encourages him to go in search of his lost friends. But will Graystripe ever find his way back to the Clan? Graystripe and Millie's journey to find ThunderClan has only just begun when the pair is faced with a series of obstacles that seem insurmountable. Getting out of Twoleg place alive isn't nearly as simple as expected, and Millie's unfamiliarity with life in the wild makes it a challenge for Graystripe to keep them both moving forward. But just when a temporary refuge is in sight, conflict with a tribe of barn cats threatens to break the travelers apart for good! Graystripe and Millie have finally found ThunderClan's old territory, but Twoleg monsters have devastated the forest and Graystripe fears that all of his Clanmates have been killed or captured by Twolegs. Millie insists that they keep looking, and an old friend helps point the two cats on the path that the Clans followed many moons ago. But danger still lurks around every turn, and Graystripe worries that he and Millie are lost on an impossible journey. There are those who follow the code of the warrior, living off the land, free from human influence. Then there are those who find solace in being a twoleg’s pet, eating pellet food and living in fat comfort. The two worlds collide after Greystripe’s land is destroyed by the humans and their machines, after which he is katnapped and made into a kittypet. 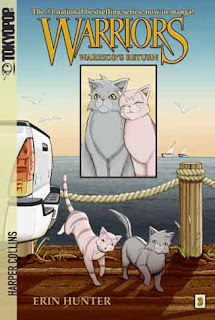 Greystripe’s journey begins when he decides to escape his human captors, return home, and find his clan. To do so, he must accept the help of a kittypet, Millie, who elects to set off on an adventure and live her life in the wild with her new friend. 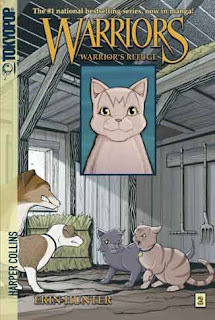 The first three volumes in the graphic adaptation of the WARRIOR novel series by Erin Hunter is an exciting manga story arc full of fast-paced kitty cat action. Warring cat cultures and human interaction create tension in the cat populations — wild and pet — and set the stage for love and adventure between two unlikely felines. Those different kitty cultures come in handy as the two move across the city and country landscape, encountering humans, cars, equipment, cats and dogs, in search of Greystripe’s homeland and people. WARRIORS is a good read, quick and action packed — just what kids love. It’s perfect for the classroom. The manga art is nicely done: clean, clear, and easy to read. The emotions of the kitties are expressive. This is a solid read for kids and will be interesting to kids of varying reading levels. If storytelling is the big concept to teach, then there is plenty in the WARRIORS for one to sink his teeth into. If culture and society is the goal — the political and cultural rules that direct our behaviors — then the WARRIORS can also be a great place to talk about such issues in a less controversial mode. Using allegory and metaphor, the differences in people and culture that we encounter can be explored using cat culture. As WARRIORS is a series of traditional novels, I think an interesting study could be done comparing and contrasting the novels with the graphic novels. Volume 4, WARRIORS: THE RISE OF SCOURGE is now available. Click here for the WARRIORS official website. 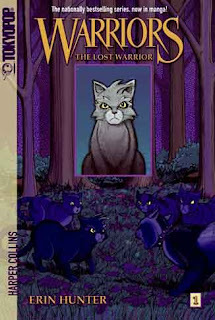 WARRIORS is a great read for kids who love action and animals.